The more we know about our patients, the better PTs we can expect to be, right? 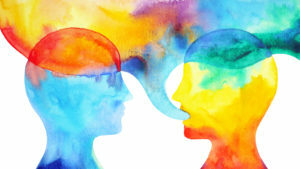 So how can we teach our patients to be better communicators? Wait, we can’t control that, but we can learn to be better listeners using a couple of simple techniques. During your time with your patient, carve out time when all you are doing is listening. Borrowing from yoga, center yourself, take a couple of deliberate deep breathes and focus your attention on the information that you are about to receive. Don’t judge, don’t problem solve, don’t let your mind wander. Instead be perfectly present and mindful of what your patient is saying to you. Of course, we all think that we are marvelous, or at least should be marvelous, at multitasking. In fact, researchers have confirmed that mono tasking is actually more productive. So….no notes no chart, no tablet, no supplies, and no phone. Your patient is the only task that you are attending to in this moment. This singular focus supports the first tip – being mindful of your patient and why you are with them. Okay, you are mindful of being a good listener and you are singularly focused on that task; now, don’t let your body forget to follow. Just like the first two tips, make a deliberate effort to present open and welcoming body language. Turn your body towards the patient and lean in. Relax your face and bring a smile behind your eyes. You have read the chart, you know the patient’s diagnosis and you even have some interventions in mind; however, try to leave those assumptions at the door and be open minded when you listen to your patient. By deliberately adopting an open mind set you might learn something else that is important to your patient. Curiosity is a universal and wonderful quality among occupational therapists. So now ask some open ended questions, give your patient time to answer, and listen carefully. Be sure the questions are open ended so you don’t end up with a series of “yes” or “no” answers. Always wait until the patient has stopped talking to ask your next question. By deliberately incorporating these suggestions, better listening will become a great new habit and will help you be a more effective PT! Welcome to a site devoted to sharing experience, knowledge and resources to make your job of being a great therapist a lot easier. I have been a clinician for 30 years. I attended San Jose State University and studied Occupational Therapy, Early Child Development and Gerontology. My passion is home health, but I have also worked with adults and children in acute and sub-acute rehab, out-patient hand therapy, transitional living for TBI and hospital-based outpatient.